4 - 5..........Chico von Forell. 4 - 4..........Ali vom Forellenbächle. 4 - 5..........Kira vom Romberg. Fee: SchH 1 and passed the Körung with Körklasse 2A rating. She is dam of the vom Binselberg “S, W” litters (Schira, Werra). 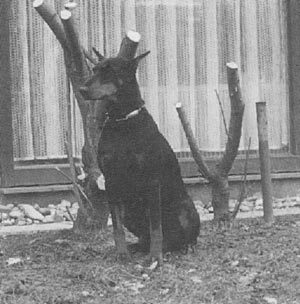 Wasko: SchH 3, FH and passed the Körung with Körklasse 1A rating plus winner of numerous show titles. He is sire of the van Manensheide “C” (Hertog Conan) and vom Kloster-Kamp “X” litter (Xira). Wolke: SchH 1 and passed the ZTP with 1A rating for character and V for conformation. She is dam of the vom Binselberg “I, L” litters (Ina, Lerry).